Victor Vermicelli and his Pasta Pet, Val the Vermicelli Snake, were speeding in a 'No Snake Lane'. They got a Big Ticket and now they have to show that they are very sorry. Victor has no idea how he can prove to the Big Ticket that he regrets what happened, but luckily Lola Lasagne wants to help Victor out. They call the Pasta Petz for assistance. Will Victor learn how to say sorry to the Big Ticket? Vermi Vay, this means Hooray!, the Pasta Kidz and Petz are back with a new adventure. The Sorry Tubes shows in a playful way how kids can say sorry after they've done something wrong. 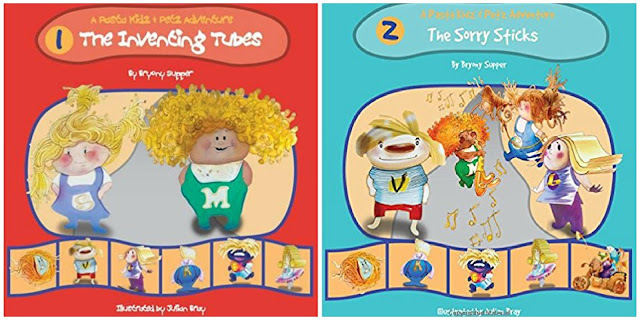 My son and I fell in love with the Pasta Kidz and Petz immediately when we started reading the first book in this series, The Inventing Tubes. All of the Pasta Kidz and Petz have recognizable features and have their own Pasta language. Bryony Supper has put a guideline into her book, so you know what the Kidz are saying in their own special words, which makes the story easy to follow. Her books are filled with humour and rhyme. I love how this makes the lines flow really well. The bright colors and the beautiful illustrations are incredibly attractive for children and all of the Pasta Kidz and Petz are unique, which is something I love about them. Bryony Supper has created an amazing series and I'm so happy she started writing about The Pasta Kidz. My son now also asks if we could eat different kinds of pasta, because he learned that there are more varieties than the ones he already knew. The Sorry Sticks is a funny story with a powerful message. Children learn that they can regret something they've done and that they can apologize and make things right again. My son is hooked on this series and is anxiously waiting to read the next Pasta Kidz adventure. 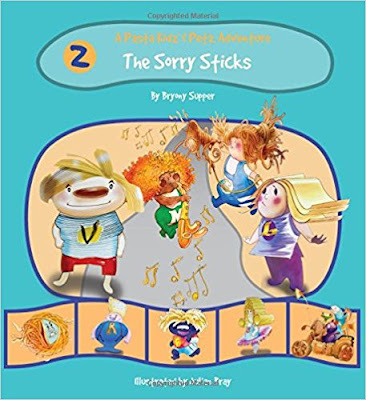 The Sorry Sticks is the second book in the amazing Pasta Kidz series, but can easily be read as a standalone. It's set in a new and unique pasta world that's filled with humour. This amazing fantasy world filled with friendship will be great to entertain 4 to 7-year-olds. Bryony Supper trained as a professional actress at the Drama Studio, Ealing. From there she went into Rep, always playing comedy roles and has a wide range of experience from the ‘Rocky Horror Show’ to stand-up comedy and children’s television – she was a regular on ITV’s Gimmee Five with Ant and Dec, writing all her own material. 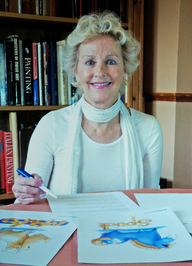 Now, using her natural talent for comedy, she has created the Pasta Kidz™ and Pasta Petz™ adventure stories for children. One very lucky reader of With Love for Books will receive signed paperback copies of The Pasta Kidz: The Inventing Tubes & The Pasta Kidz: The Sorry Sticks. The winner will be notified by email and has 3 days to respond. All of our giveaways are international. How lovely to introduce children to adventure and life experiences. These books sound like they have a humorous story that will grasp the imagination of children. The illustrations look detailed and colourful and I love the fact that with the names of the character you also got a different type of pasta. This sounds like a really funny story that my son would really enjoy. looks like a great gift for my daughter! Sounds like fun for kids. I'm sure my grandchildren would enjoy reading these entertaining books. I think my nephew would enjoy these. I love the message this sends to children and I love the illustrations! Perfect story for my 9 year old. I love it. Love the idea of the book. The cover is bright and colourful too and children will enjoy the cheerful images. The names of the characters make me laugh.